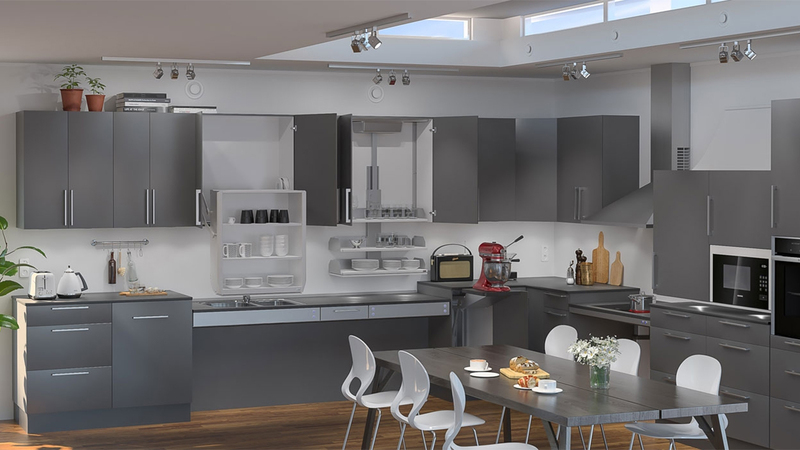 This interactive kitchen animation is the best place to see how the Granberg height adjustable systems operate. From rise and fall worktops and wall cabinets to small appliance lifts, we're sure we can provide you with the most suitable system to ease the use of the kitchen for all users. The Granberg Unilift 870 is an electric appliance lift for kitchen base units. It raises a shelf from the bottom of the kitchen unit to the desired working height. It can be used to lift food processors, microwaves or other household appliances. The Baselift 6300LA is an electric rise and fall worktop lift by renowned Swedish manufacturer Granberg. Its innovative compartment frame design allows for the installation of facia fronts and accessories. The 6300LA series is particularly suited for worktops and hobs due to its shallow frame height of 40mm. The Granberg Verti is an electric wall cabinet lift which lowers the cabinet's shelves and contents down to the user in a vertical motion. The Granberg InDiago is an electric wall cabinet lift which lowers the cabinet's shelves and contents down to the user in a diagonal motion to the front edge of the worktop. The Baselift 6300HA is an electric rise and fall worktop lift by renowned Swedish manufacturer Granberg. Its innovative compartment frame design allows for the installation of facia fronts and accessories. The 6300HA series is particularly suited for kitchen sinks and drawers due to its increased frame height of 103mm.